Can you spot the join in these two circles? If you’ve been crocheting for any length of time, you will more than likely be able to spot the slip stitch join in the right circle. To the “trained eye”, it sticks out like a sore thumb. Even the untrained eye can see an inconsistency in the round of stitches. Now have a look at the left circle. Can you spot the join? This is what make the invisible join so neat. It is…well…invisible! Learning this technique is sure to take your crocheting skills and finished projects up a notch. 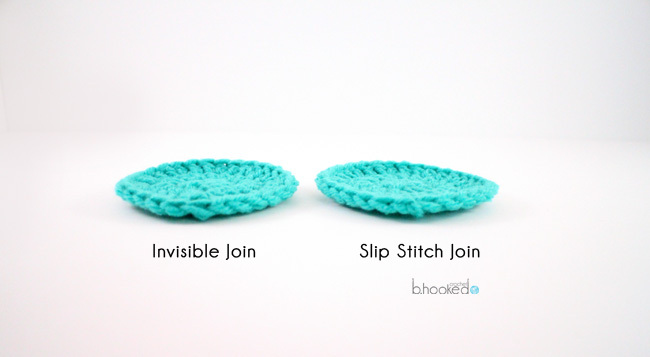 When is the crochet invisible join used? The crochet invisible join is a great technique, however, it can only be used in certain situations. 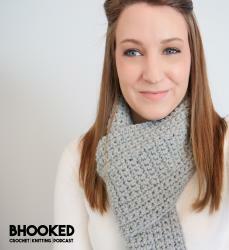 The invisible join is a crochet bind off method that works only when working in the round. The crochet invisible join creates a “V” over the starting chain from the last round. In a typical slip stitch bind off, you will join with a slip stitch to the top chain. This technique does two unsightly things to your finished piece: rotates the chain in the forward position creating a visible “braid” and leaves a noticeable bump on the top. When you use the invisible join, you are hiding the chain and creating a “V” to match the other stitches. This solves both problems for you! Before we proceed to the video tutorial, let me first say that this technique is doable by crocheters of ALL levels. 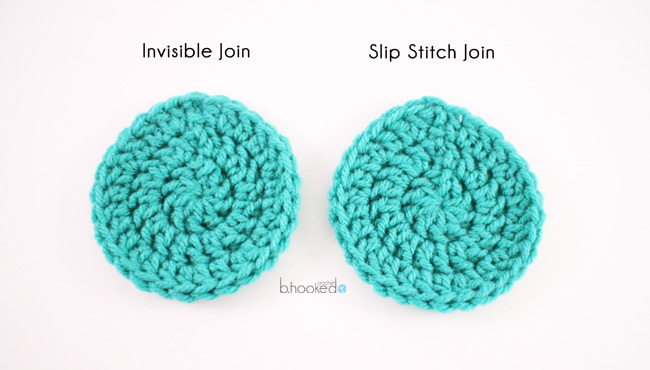 Yes, the crochet invisible join is so easy, even the newest beginners can do it! This video is available in a left handed version. Click here to be directed to the left hand tutorial on YouTube. Once you have completed your final round, do not join with a slip stitch. Cut your working yarn, leaving yourself a tail that is approximately 6″ long. Pull up on your hook, pulling the loose tail through the stitch. Thread the tail with your darning needle. Insert your darning needle (from right side to wrong side) through the first stitch of the round, the one that is directly next to your tail. Be sure to work the tail under both loops of the “v” of that stitch. Pull the tail to bring the two ends together, but do not pull too tight. Looking at your piece from the top so you can see the “v’s”, insert your darning needle in between the loops of the “v” from the last stitch (the one where you made the bind off). Feed your darning needle out the back through to the wrong side of the work. Pull the tail so it creates a similar tension to the rest of the “v’s”. Weave in your tail very carefully so the bind off stays in place. What kind of projects is the crochet invisible join good for? These are just some of the most common applications. Have you tried the invisible join? What is your opinion of this technique? Leave your thoughts in the comments below! Please do written instructions to invisible joinings. I enjoy seeing your work on facebook. Thank you for posting! Thank you for the request, Hazel! I plan on adding written instructions as I’ve had a few requests already! Is there a written out instructions for this invisible join stitch? It would sure help opt. Love your tips! That is a great suggestion, I’ll add the written instructions!